In 1807, Telfair County was the 35th county formed in Georgia. It was named after Governor Edward Telfair and primarily settled by Scottish Presbyterians from the Carolinas. The mild climate throughout the year affords unlimited opportunities for recreation. Telfair’s creeks and rivers provide bountiful fishing and water activities. Hunters delight in the dove, quail, wild turkey, deer, and small game. The county and state rural roads provides a pleasant mixture of gently rolling hills dotted with our number one natural product - pine trees and other country side views. In the summer the sweet fragrance of honeysuckle adds to a delightful evening ride. Jacksonville, Georgia is named for General Andrew Jackson and was the first county seat of government for Telfair County. Between 1807 and 1812, court was held in various homes. In 1812 a courthouse was erected on the site of the present Methodist Church. In 1871 the county seat moved to McRae. Jacksonville was an important part of the Blackshear Trail which followed the Altamaha and Ocmulgee Rivers from Darien to Fort Hawkins. It was also the center of a large and wealthy plantation economy. Jacksonville was a landing for freight and passenger traffic on the river some years before and after the War between the States. The southern part of the City is bordered by the Ocmulgee River. Douglas Electric and Plumbing is looking for a subcontractor for the Rehabilitation of Elevated Water Storage Tank and Well houses Community Development Block Grant, Grant #14P-X-134-2-5857, located in the City of Jacksonville. Subcontract will include a well driller and water tank rehabilitation contractor and is estimated to start during the month of January 2018. Subcontractor must be a licensed/registered business in the State of Georgia for the trade you are submitting a bid/contract on, must satisfy all insurance, must complete the Section 3 Solicitation Package and include all necessary back up documentation, and if subcontractor has never worked with the recipient, sub-recipient, project administrator, project engineer, or prime contractor, subcontractor may be required to provide a bond for 100% of bid amount payable to the prime contractor. This subcontract is covered under the requirements of Section 3 of the HUD Act of 1968. This subcontract opportunity is a Section 3 Covered Contract. Section 3 Business Concerns are encouraged to apply. Please contact Chris Malphus at (912) 384-2429 or email at dep1@windstream.net. Lumber City, GA was incorporated on September 3, 1889. In the 1800’s, Lumber City was a thriving town due to the tremendous amount of lumber and other products being shipped by steamboats to Brunswick and Darien, GA down the Ocmulgee River. Also, steamboats on the Ocmulgee River made connections with Southern Railroad in Lumber City. It was once known as the “Artesian City” due to the numerous artesian wells. Lumber City is also home of the historic train trestle. This historical structure can be seen from US Hwy 341, just south of Lumber City, as you are crossing the Ocmulgee River. It is not clear as to the date of the construction of this Lumber City landmark but it could have been as early as 1910. This once was a rotating bridge. In the 1800’s and until the early 1900’s steamboats traveled the Ocmulgee River. The trestle was operated from the shed on top of the structure from where the operator could see activity along the river and the rail tracts. The bridge no longer rotates but is still used on a daily basis for rail traffic. The City of McRae became the county seat in 1871 and was incorporated on March 3, 1874. It was named after Daniel Murphy McRae, a Scottish-man, who is known for aiding in Telfair’s county seat being moved from Jacksonville to McRae. The City of Helena was incorporated on January 1, 1890. It was known as a small friendly town. On January 1, 2015, McRae and Helena made history as the first city-to-city merger in decades. The two sister cities known as the City of McRae and the City of Helena, is now known as the City of McRae-Helena. The city’s new name dates to the time when the local school system was known as McRae-Helena Schools. By consolidating, the two cities will be able to provide better services for their citizens. McRae-Helena is also known as a crossroad city due to the fact that five major highways cross in the city: 441, 341, 319, 280, 23. McRae-Helena also has a replica of the Statue of Liberty that is one -twelfth the size of the original. 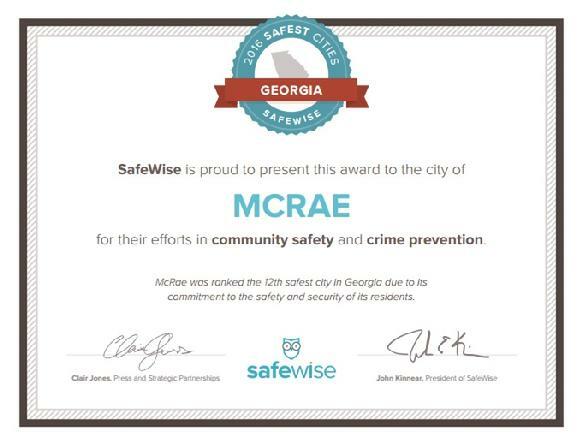 SafeWise is proud to present this award to the City of McRae for their eff­orts in community safety and crime prevention. McRae was ranked the 12th safest city in Georgia due to its commitment to the safety and security of its residents. What? SafeWise announced the 20 Safest Cities in Georgia for 2016. How/When? SafeWise released its 20 Safest Cities in Georgia Report on January 19, 2016. To compile this report, SafeWise analysts considered the most recent FBI crime data from 2014 to rank these cities, which all have a minimum population of 4,000 people. Who is SafeWise? SafeWise is a community-focused safety organization committed to increasing home and community safety, education, awareness, and preparedness. The SafeWise brand has been recognized by many trusted publications, including The Huffington Post, AngiesList, Mashable, and Homes.com, for their efforts to award law enforcement, neighborhood watch, and civic leaders who go the extra mile to keep their neighborhoods safe. Visit our Georgia State Crime Prevention Center for more helpful Georgia safety resources. Our town is the county seat of Telfair County located in the Magnolia Midlands of Georgia. McRae, like many of the state’s small towns was established after the Civil War when railroads opened the interior of the state to more extensive development. The Ocmulgee and Little Ocmulgee Rivers opened the original pine forests to harvest, providing access to seaboard markets. Naval stores and cotton dominated the area’s endeavors in the later 1800s. It was then that many fine neo- classical homes were constructed; many using local oak and heart pine. McRae, a crossroads of its time, experienced a housing boom circa 1900 that resulted in a large number of fine homes, many of which remain today. Telfair remains largely agricultural with the exception of Husqvarna, the world’s largest manufacturer of grass mowers. Cotton, peanuts and corn are the major crops. The county is known for its fine fishing and hunting – the world record largemouth bass was caught here in 1932 and it remains the record today. The county more recently produced the state record atypical white tail deer. Georgia’s best kept secret, the Wallace Adams Golf Course at Little Ocmulgee State Park, located within 2 miles of McRae is recognized as one of the finest public courses in the state. McRae is blessed with good weather year round and the area is amazing free of natural disaster. The climate, housing, churches, schools and infrastructure make it a wonderful place to raise a family. Our citizens are friendly and welcoming – an asset only surpassed by the picturesque neighborhoods and many fine homes. The historic neighborhood of McRae features a number of large neoclassical homes in a variety of styles. Many of these two story homes are Greek Revival, Victorian, or Mission in style. Also, there are a number of single story vernacular Plantation Cottages of the same 1890 – 1920 period. A number of these homes and a number of homes of recent construction are available. The medium home price for homes in McRae is $70K. The price range for the larger homes is $275- $475K. McRae is located midway between Macon and Savannah Georgia in the heart of the Coastal Plain. The city and surrounding county are blessed with an abundance of fresh water, sandy soil and a pleasant climate; outdoor activities as well as agriculture flourish. The local school system features up to date facilities, excellent teachers and award winning achievement. A number of colleges and universities are located in close proximity and our students are eligible for the State’s Hope Scholarship program. The lakes and rivers, Horse Creek Wildlife Management Area, Little Ocmulgee State Park, and the new Telfair County Recreational Complex contribute to the healthy lifestyle of our citizens. Azaleas, crepe myrtles, roses, gardenias and camellias, verdant green lawns, along with stately oaks, magnolias, pine and pecan trees all contribute to the city’s beauty and to our quality of life. The beauty of the area, its stress free climate and low cost of living, combine with the excellent supporting infrastructure to make it a great place to retire or to raise a family. With the coming of the Seaboard Railroad in the early 1800’s came the beginning of Milan, GA. A train depot was constructed in 1899 and name the Milan Depot by the wife of an executive of the railroad after she returned from a visit to Europe. This depot is still standing and has recently been refurbished. Railroad transportation made it easy for farmers to ship their products to seaport cities. At one time, Milan had three cotton gins, sawmills and turpentine stills. Part of the city is located in Telfair County and part in Dodge County. Milan is a serene and peaceful community surrounded by rich farmlands. Scotland was originally named McVille after the Civil War and was populated mostly by Scottish Presbyterians. McVille was chartered on September 23, 1881 and land was settled by land owned by Barnabus Livingston. On August 9, 1911, it was chartered as Scotland, GA.
Gum Swamp or as some know it, Little Ocmulgee River, follows the outer edge of Scotland where, at one time, thousands of logs were rafted down to Darien, GA. It was also one of the chief cotton markets of this territory.